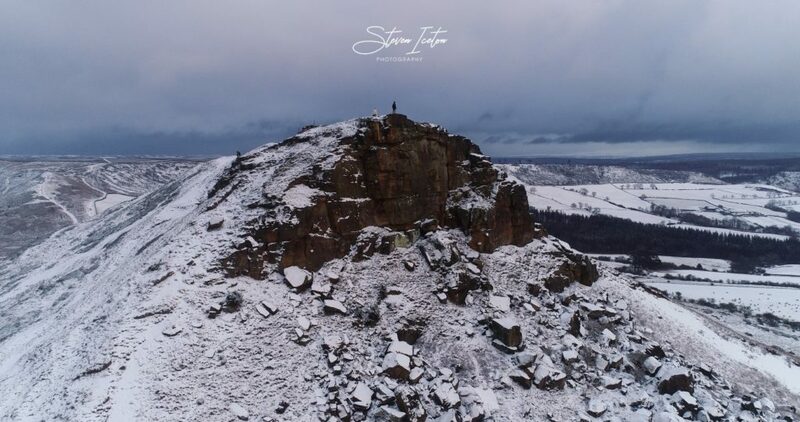 With the arrival of cold winds from the East out of Siberia, snow began to fall and transform the moors into a winter wonderland. I took the Friday afternoon off work, charged the drone and camera and set up to head out. 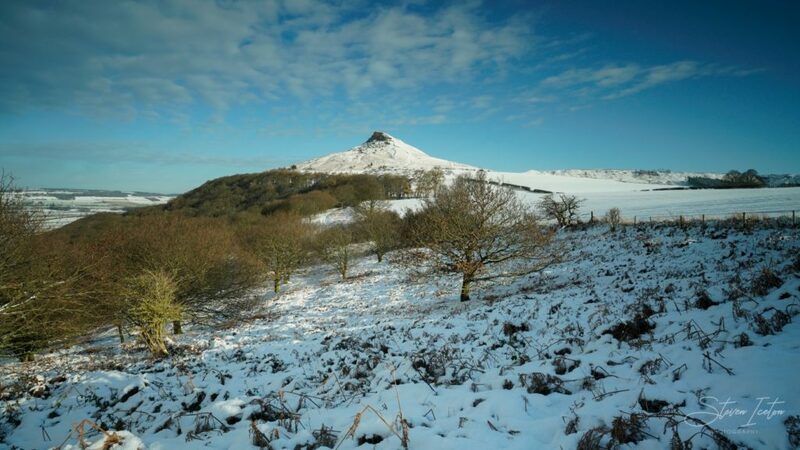 Last winter’s snow saw me make a similar trip where I tried and failed miserably for a while to get up many of the icebound tracks to the top of Roseberry Topping. I ended up using my tripod in attempt to claw my way to the top. I actually caused it some damage which took a few months to sort out! 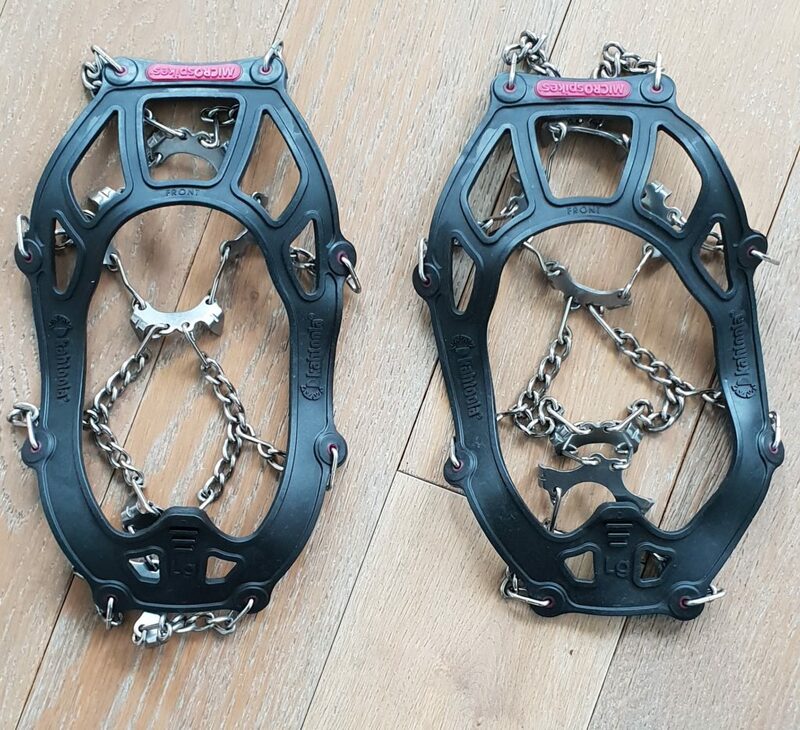 (never again)… With this in mind I had come prepared and invested in some cleats for my boots, to anyone not familiar they are a set of spikes that can be chained on to your feet which make walking on ice a whole lot easier and safer! Kahtoola Microspikes – highly recommended! The climb to the top was hard work carrying all the kit but would have been near impossible without the cleats on my boots. 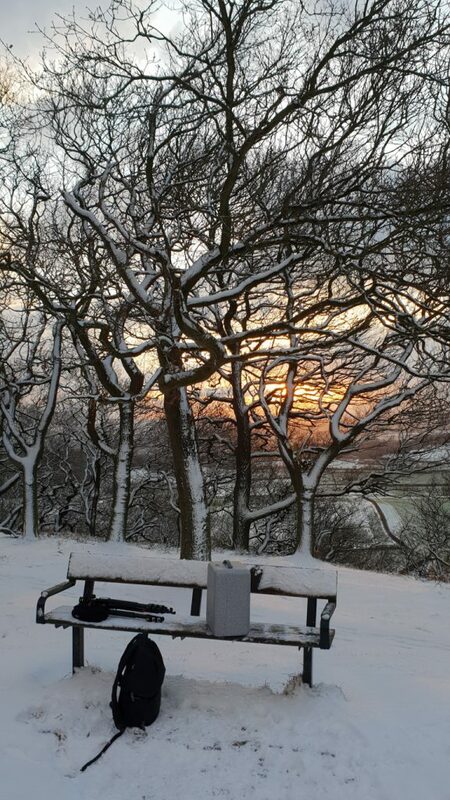 Newton Woods – taking a break after the climb. 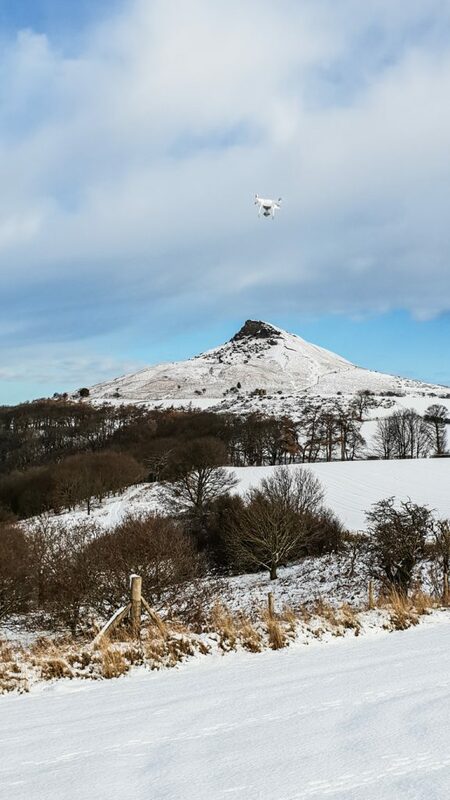 I set the drone out to capture some footage of the sunset around the peak, the still below was captured out of the video using Adobe Premiere Pro. 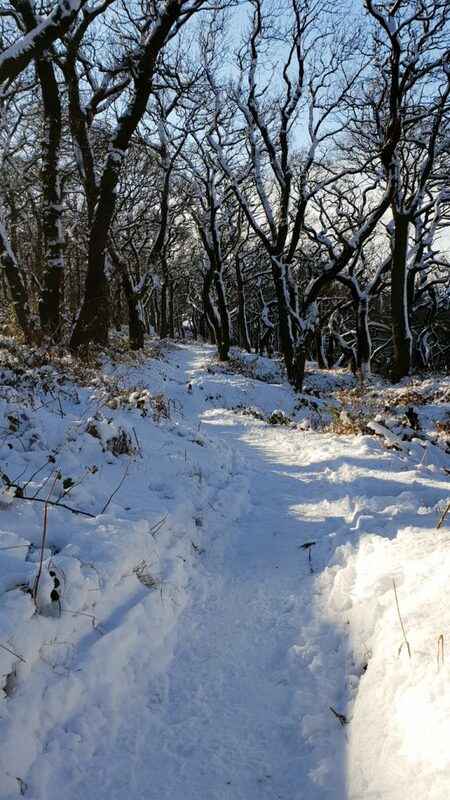 The snow was so deep last winter that the bushes at the bottom of this shot beneath the shooting box were entirely covered in snow, many feet deep, climbing over this snow drift I fell through into one of the gorse bushes hidden underneath… ouch! 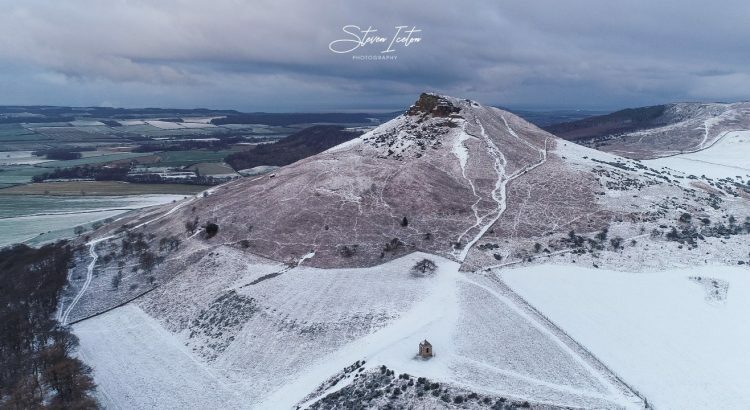 The weekend saw even more snow so I headed back out shortly after sunrise this time to capture some timelapse and some more drone footage, it was a chilly morning with lows of -6c and all the roads were frozen and treacherous but the sun was shining and it was great to be out. I climbed up through Newton Woods and headed to an area where I know of a timepost in the ground, a timepost is a post used to fix a location to allow shots to be repeated on different days with the same composition. I plan to capture a timelapse through the seasons at this location for a documentary I am working on. 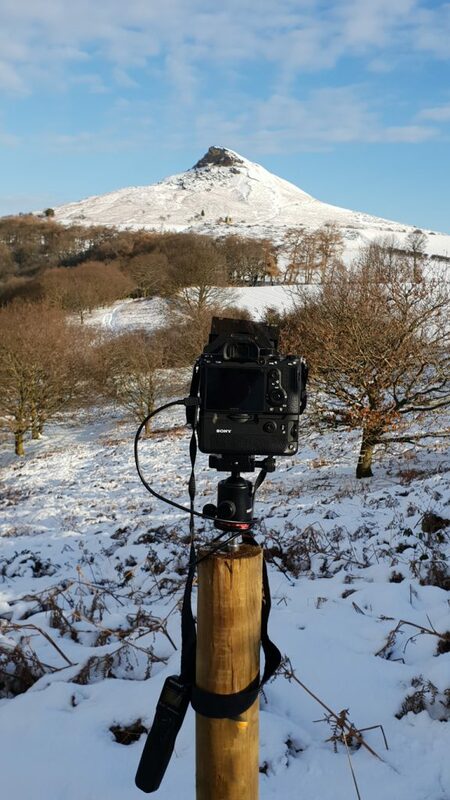 Capturing a timelapse using a timepost. A still from the timelapse, ready to repeat in spring when the bluebells are in bloom and summer when the vegetation is lush and green. 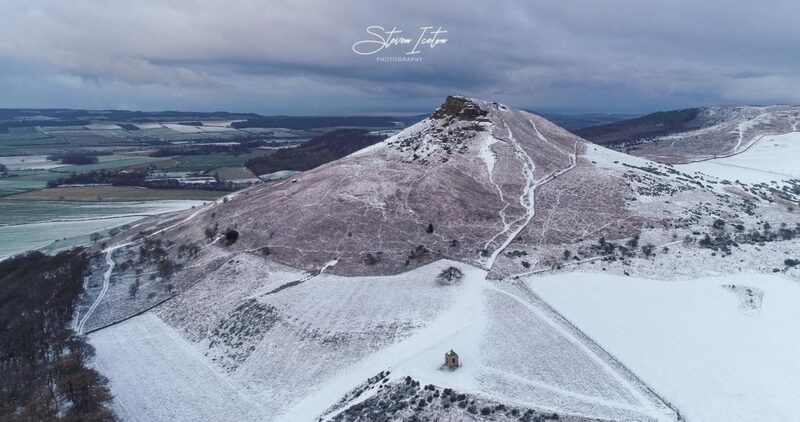 Once I had set the timelapse running I got the drone out to capture some more of the crisp morning. 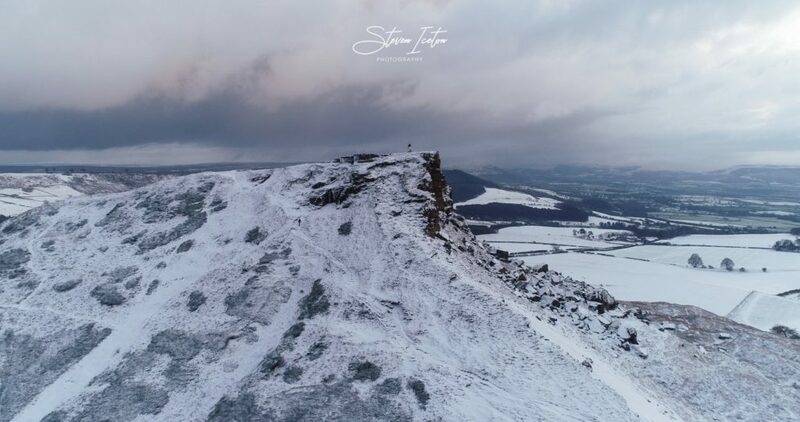 DJI Phantom 4 Pro – the snow was quite deep so I took off from the top of the box, always a bit risky in windy conditions. Learning my lessons from past mistakes as soon as the engines started I lifted the drone straight up. On its return I did a catch landing to avoid getting it covered in snow. 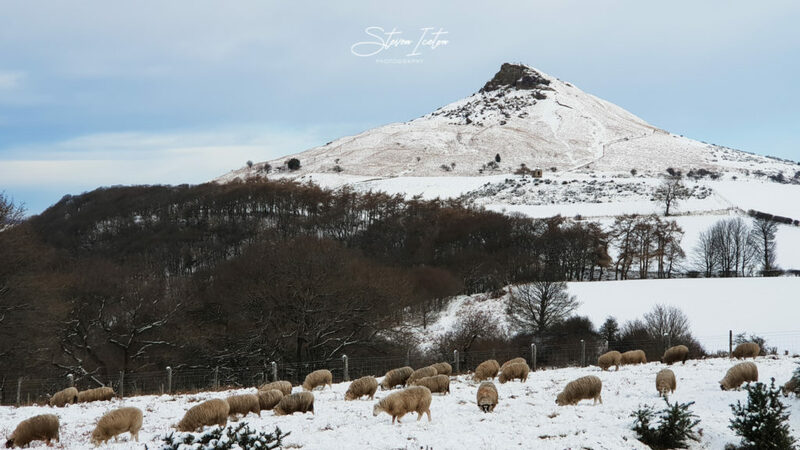 I took a walk further around into Aireyholme Farm to capture some views of Roseberry Topping through the farmland. 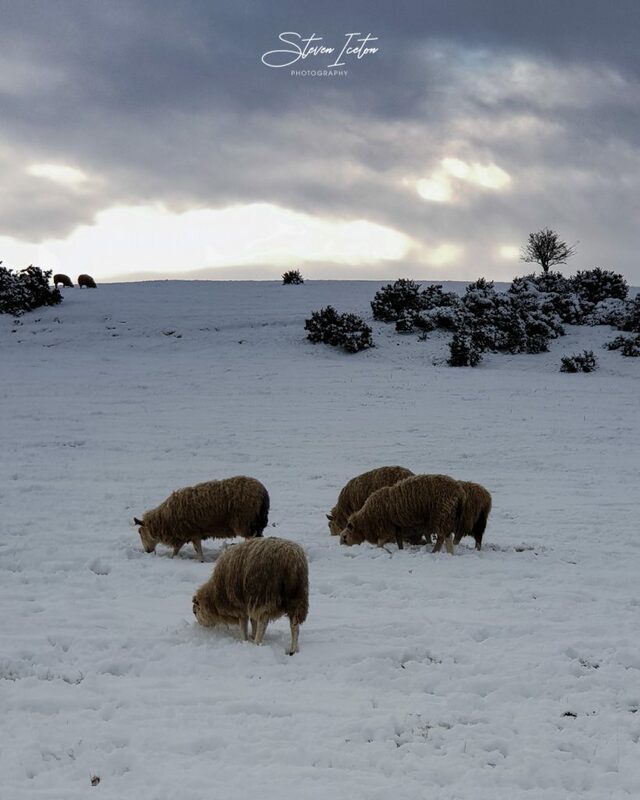 Sheep grazing through the snow . 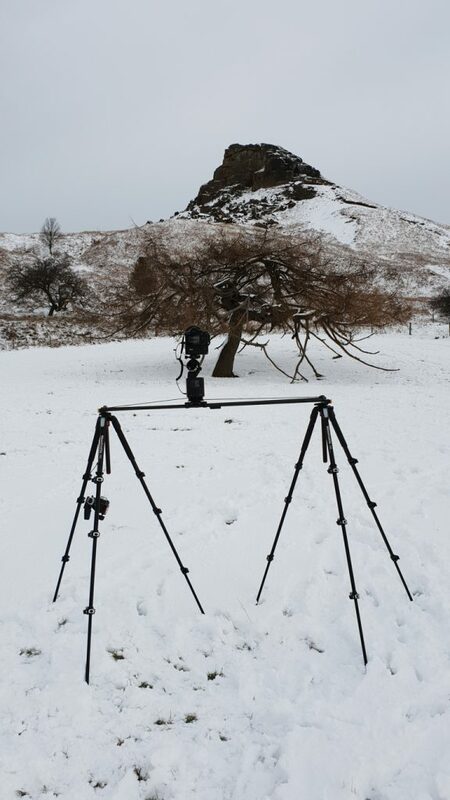 Setting up a timelapse using a Syrp Genie motion control device for the parallax effect, unfortunately it was too windy on the day and the camera was being knocked around by the wind so I stopped the sequence shortly after starting it. It would have just been a blurry mess! The conditions were definitely worsening at this stage and the weather had set in, time to head home. Great spot to chat to the passing walkers though! I caught a quick static timelapse of them on the ascent to the summit. Some stills extracted from the videos captured with my DJI Phantom 4 Pro drone. On the edge – a lone walker stands on the cliff face watching the last of the sun setting through a stormy sky. 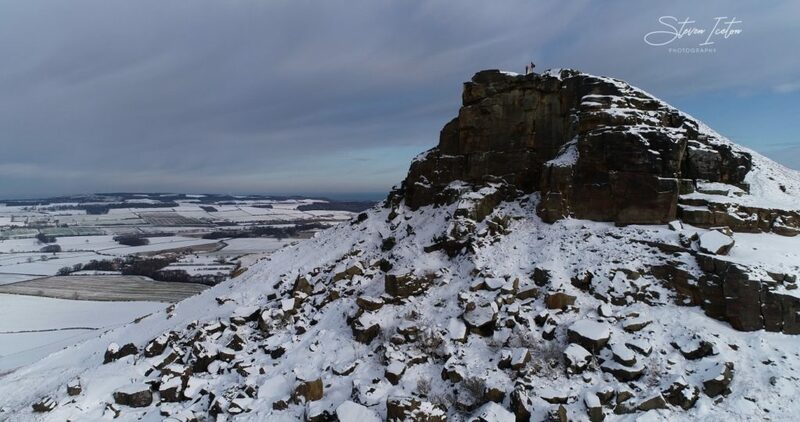 Roseberry Topping used to be round but a collapse of the hill in olden times caused the current cliff face, boulders can be seen in the snow strewn down the slope.